Las Vegas, Nevada is the site of the PPAi Show from January 13-15, 2015 where Graphics One will feature both the F-24 and F-24XL small format UV inkjet printer duo. As we say, GO Wide, GO Fast, GO Deep and now...GO Long. The XLGO's new X-24XL comes standard with a 24-inch by 47-inch table, and of course 8-inch depth, make this unit the leader in printable space. What does this mean for you? It means that many unique objects which were not printable before can now be printed using the XL print engine. Further the XL print engine is scalable up to a full 79-inch length. 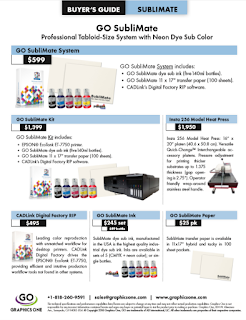 There are a number of firsts with the GO F-24XL UV flatbed printer. Not only is the length impressive, but the manner in which the substrate is handled is unique in that the XL has a conveyor system which is more capable than other methods used by other manufacturers. Additionally, the new liquid cooled dual UV LED lamps enhance the overall imaging and also substantially enhance the life of the lamps.